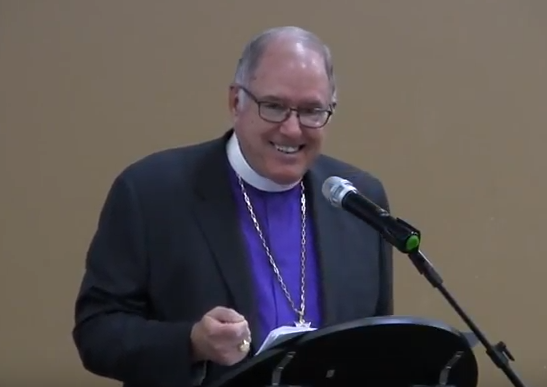 Bishop Scott Mayer delivered his address to the 35th Convention of the Diocese of Fort Worth on Friday, November 10, at the Cleburne Conference Center in Cleburne, TX. he continues, “I want to begin today by looking at the phrase, “raise your eyes.” One of the early Church theologians (named Origen) tells us that “lift up your eyes” occurs in many places in Scripture when the divine Word admonishes us to exalt and lift up our thoughts, and elevate our insight. We could think of this as an epiphany, a moment when something which was true all along is made known – an “aha moment,” a sudden awareness. Watch a video of the address below, or on YouTube. Convention sermon: "Drink living water . . ."